Violet Stoner Albright, 104, died Sunday, July 1, 2018, at Elmwood at the Shawhan. 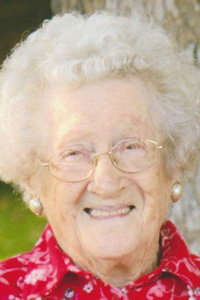 She was born Sep. 2, 1913, in Tiffin, to Harry and Gertrude (Kilgore) Milliron. She married Merl Stoner in 1938 and he died in 1963. In 1971, Violet married Everett “Bud” Albright and he died in 1985. Surviving are her son, William (Sally) Stoner; daughter-in-law, Joan Stoner; two granddaughters, Michelle (Chris) Tschanen and Linda (Peter) Auger; three great-granddaughters, Kayleigh, Kelsey and Kerry Tschanen; two special stepgranddaughters, Venus Albright Breinich and Kristy (Rick) Martin; two stepgreat-grandchildren, Bailey and Connor Martin; and a stepgreat-great-granddaughter, Averie Trevino. She also was preceded in death by her son, John Stoner; three stepsons, Robert, Gerald and Leslie Albright; a brother, Edward Milliron; and a sister, Dorothy Milliron McClory. Violet was a seamstress. She made all the cheerleading outfits for Tiffin Columbian High School during the 1950s. She learned how to make draperies while working at Home Decorating in downtown Tiffin. When that closed, she became an independent contractor, and for many years made drapes for numerous families in the Tiffin area. Her family wants to thank all the staff who were so gracious to Grams during the last six and a half years she was a resident at Elmwood at the Shawhan. She made many new friends during that time, including her volunteer, Mary Ellen Jacobs. There will be a celebration of Violet’s life 2-4 p.m. Friday, July 6, 2018, in the dining hall at Elmwood at the Shawhan, 54 S. Washington St., Tiffin. Burial will take place in Fairmont Cemetery, Tiffin, at a later date. Engle-Shook Funeral Home and Crematory, Tiffin, is assisting the family with their arrangements. Memorial donations may be made to F.A.C.T. or the Humane Society of Seneca County. Online condolences may be left for the family at www.engleshookfuneralhome.com.